Flow was a socially-engaged project where the exhibition of art and installations set the framework and jumping off point for community conversations around water issues, rights and usage during multiple events. Sherri Cornett, with gallery director Dr. Leanne Gilbertson, created opportunities for community interaction, where the gallery was set up as a laboratory - a space for experimentation, dialogue and collaboration. With the exhibition and events, viewers, participants, artists, river users, and civic leaders were encouraged to think outside their own understanding and establish a more comprehensive and informed perspective about how water affects our lives and livelihoods. an installation of Sherri Cornett's Grottoes Series (13 wall-mounted, mixed media, 3D sculptures including video meditations on water) in Northcutt Steele Gallery, Montana State University Billings. The goal of this series is to create a backdrop for conversations about water rights and conservation - where the sculptures and their videos are visual reminders of water as common ground. Juried artworks by MSUBillings' alumni and students Karin Calabrese, Michelle Dyk/Peter Tolton/Luke Kestner, Tabetha Rindahl, Stephanie Slavin/Joel Miller, Patrick Williams and Dylan Woods further encouraged viewers to consider the role of water in their lives. Interpretations of water by Girls Scouts of Montana and Wyoming and the Boys & Girls Club of Billings, and students from Will James Middle School. February 11, 2016, 5 - 7 p.m. Under the direction of Tami Haaland (Faculty, English, Philosophy & Modern Languages) and John Roberts (Faculty, Music). MSU Billings Creative Writing students Amelia Bacon, Desiree Kling, Thomas Mendenhall Sierra Parcel, and Sarah Williams wrote responses to the works in the FLOW exhibition and researched poems from well-known poets that address themes of water and read a selection of these works. MSU Billings Music students Tyler Briceno (drums), Juanilla Chavis (bass) and Drew McDowell (guitar) accompanied by John Roberts will improvise responses to the readings. In collaboration with Northern Plains Resource Council, this evening provided an opportunity for our community to learn more about oil and gas development and its effects on water resources. A screening of Eric Warren's "Mixing Oil and Water" was followed by a facilitated audience discussion with comments from Sue Beug and Becky Mitchell of Northern Plains Resources Council. The Yellowstone River Cumulative Effects Analysis, of which Dr. Susan Gilbertz's Yellowstone River Cultural Inventory is a part, is the culmination of an internationally unique, multi-agency, comprehensive watershed study that arose from the effects of the floods of 1996-1997. The data collected in this study addresses hydrologic, socioeconomic and biological issues on the Yellowstone River. This analysis has included an interdisciplinary scientific characterization of relationships between human activities and associated river system responses. Based on this analysis, recommendations were developed for management practices and actions that will provide sustainability to socioeconomic interests while maintain the long-term biological and physical integrity of the river system. Presentations and audience discussion focused specifically on the riparian and channel migration zones of the river, which were identified as the least understood aspects of the river, but which have major impact on future use of the river by land owners, recreationalists, and agriculturists as well as survival of species. This discussion broadened understanding and enlighten planning efforts by user groups, civic leaders and policy makers. Carrie La Seur, Ph.D., J.D. FREE PARKING on campus after 4:30 p.m. Guests may park in STUDENT LOTS ONLY. (parking map)​ Reminder: visitor lots always require a visitor permit from the on-site dispenser. Dr. Susan Gilbertz offered a one-time-only course in conjunction with our Flow project for students of both campuses. It was titled "Yellowstone: Voices and Science"
The course focused on the findings of the "Yellowstone River Cultural Inventory" http://yellowstonerivercouncil.org/dev/resources.php, and the final scientific reports of the Cumulative Effects Study of the Yellowstone River (sponsored by the US army Corp of Engineers and the Yellowstone River Conservation District Council). From those reports, students will select a focus of concern and detail a comparison of scientific findings and cultural knowledge. The students presented abbreviated versions of their work at the February 25th FLOW symposium, at MSUB. The short course begins Wednesday, January 20th and concludes on February 25th with the symposium. It is a 2-credit course and will meet on Wednesday 10:30-11:30, plus Thursday evenings 5-9:00. Included in the Thursday evening sessions is attendance at the other FLOW events in February. "Living in Harmony on the Yellowstone"
As a commission from this project, Bonny Beth Luhman and Ariel Grossfield, MSUB art students, created a video interpretation of the user group comments and insights collected by Dr. Susan Gilbertz (Director of the Environmental Studies Program, MSUB) and colleagues in their Yellowstone River Cultural Inventory 2006 comment (full cultural study accessible here). The video was shown in the Northcutt Steele Gallery during the length of the exhibition. 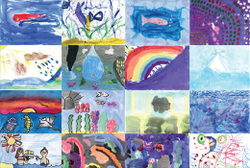 Art education students from Montana State University Billings brought the Flow project to the area K-8 students, asking them to create 5 x 7 inch panel depictions of water. Workshops were conducted with the Girl Scouts of Montana and Wyoming, the Boys and Girls Club of Billings and at Will James Middle School. These will be displayed in the Outer Gallery at the university from January 28 - March 18, 2016, in conjunction with the Flow exhibition. ​Please visit the Youth Outreach page for images of the workshops and art panels. The MSUBillings Library will pull from their collection to create a display of water-related materials in the library entrance and in reading areas, including the Young Adult and Children's area. Precious McKenzie, Author and Assistant Professor, English, Rocky Mountain College, donated her books to the MSUBillings Library for its collection and to be displayed during the Flow exhibition. For more information and a list of materials, please go to our Reading Areas page. Documentation is critical to socially-engaged projects as much of the content involves community events. This project was documented fully on this website with additional content on the Northcutt Steele Gallery and university sites. The Yellowstone River Research Center (YRRC) is a multidisciplinary research institute composed of geologists, ecologists, wildlife biologists, geographers, and social scientists at Rocky Mountain College (Billings, MT). The center is positioned in an area that is a microcosm of the northern Rocky Mountain region, where some of the nation’s most pristine environments coincide with ongoing processes of resource extraction, agriculture, industrial activity and increasing human settlement. Northern Plains Resource Council is a grassroots conservation and family agriculture group that organizes Montana citizens to protect our water quality, family farms and ranches, and unique quality of life. Northern Plains protects Montana’s greatest assets: the quality of our natural resources, the character and viability of family-based agriculture, and the ability of citizens to shape the public policies that affect our land, our water, and our lives so that we may pass them on, unimpaired, to future generations. Northern Plains members work to ensure the long term health of Montana by putting community interests above oil and gas profits and empowering communities to guide development. Members work at the state policy and local level to implement laws and permitting practices that ensure responsible development that protects our water and communities from the potential negative effects of oil and gas development. "At project’s end, a close look at the Yellowstone River"
"Health of the Yellowstone topic of river talk"
"Flow – Exhibition and Community Project"
"Flow: Artist Sherri Cornett draws inspiration from the Yellowstone"